Provide comfort for the family of Brenda Chappell with a meaningful gesture of sympathy. 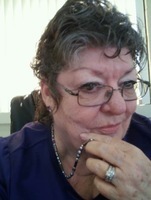 Brenda Kay Ferguson Chappell, 72, went home to be with the Lord, Saturday, January 19, 2019 in Fort Worth. She was born February 11, 1946 in Drumright, Oklahoma to Robert Warren and Mary Ellen (Hicks) Ferguson. They both preceded her in death along with her son, James Chappell, Jr. Brenda loved to paint, garden and hummingbirds. She was the “Best Sooners Fan” and as a mamaw, she loved her grandkids more. Brenda is survived by her devoted husband, James Chappell; daughter, Renee Trapasso and husband, David; son, Bill Chappell and wife Barbara; sisters, Betty (Jim) Stevenson and LuAn Presser; brother, Randy (DeAnna) Ferguson; twelve grandchildren and 15 great grandchildren. To send flowers in memory of Brenda Kay Chappell (Ferguson), please visit our Heartfelt Sympathies Store. Provide comfort for the family of Brenda Kay Chappell (Ferguson) by sending flowers. My condolences to the Chappell family during this difficult time. In the Bible, Jehovah God gives us hope. Acts 24:15 says, “there is going to be a resurrection of both the righteous and the unrighteous.” Revelation 21:4 says, “and he will wipe out every tear from their eyes and death will be no more.” Very soon we will see the fulfillment of these promises here on Earth.